You probably already know that drinking alcohol can have a negative impact on your skin, as it dehydrates it. Not to mention how it can make you forget to take off your makeup off after a night out! But that’s not what we’re going to be talking about today. We’re going to focus on alcohol in skincare products and why this isn’t always a bad thing. In fact, some alcohols can actually be very beneficial for your skin and help improve it. So let’s find out why and how. Firstly it’s important to note that there are many different types of alcohol that you can find in skincare products. But not all of them are beneficial for your skin. So let’s look now at the different types of alcohol in skincare products. And if they’re good or bad for your skin. Why is Alcohol used in Skincare Products? Here are some of the reasons alcohol is included as an ingredient in cosmetics. *It’s used as a preservative to help keep bacteria and germs from contaminating your products. *Alcohol makes products dry faster on the skin. Think of things such as gels and hand sanitisers. *Alcohol helps other ingredients mix together which will help them to penetrate the skin faster. Now you’re probably thinking so far so good and that those reasons aren’t bad. And you’re right. But the problem is that the alcohols that do all of the above are the bad kind of alcohols. They actually do much more harm than good! And they’re in no way beneficial for your skin. Before we get to the good stuff, it’s also important to know which alcohols to avoid in your skincare products. And why you should avoid them. Just like drinking alcohol can leave your skin dry, dull and dehydrated, so can some types of alcohol in skincare products. And this then leads to fine lines and wrinkles if the skin becomes really dry. If you have sensitive skin, then you really need to keep an eye on your product ingredients labels to see if they contain any alcohols. As it can really irritate your skin even further and cause breakouts. Acne prone skin should also be careful to avoid some types of alcohol in skincare products. If you have oily skin, it can seem like using products that have a drier texture are better for your skin. But actually, if you’re using products that contain the bad alcohols that cause a drying effect on the skin, they’ll actually cause your skin to produce even more oil. The bad alcohols can actually damage the skin. You see, although alcohol can help other ingredients to penetrate the skin more quickly, this isn’t actually a good thing. As those alcohols are actually harming the outer layers of the skin in order to do this. As the alcohol is dehydrating and damages the outer layers of the skin, the signs of ageing will appear on the skin a lot more quickly as it’s protective barriers are damaged. It’s not just your skincare products that contain alcohol. You’ll also find it in your hair care products, like hairspray, for example. Dry hair causes the hair to become brittle and causes split ends and ultimately breakages. Another thing to be aware of is, as I’ve just mentioned in point #3 above, some alcohol can cause irritations. So if you already have a sensitive or dry scalp, you need to be careful not to irritate it even further. What types of products will you find these alcohols in? Facial toners are one of the main types of skin care product that contains alcohol. And this is something I talked about here and why to avoid them and what you can use instead. And as I’ve already mentioned, you’ll also find them in hair care products such as hairspray. They’re also in body care products such as hand sanitizers. Or products that have a gel consistency and dry quickly. This can even include sun protection sprays. Even perfumes can contain some of the bad alcohol. And remember, you spray perfume on your neck. So this means, this can cause not only irritations on this area, but can cause dryness of the skin too. Here are some of the bad alcohols to watch out for on ingredients labels so you know which ones to avoid. 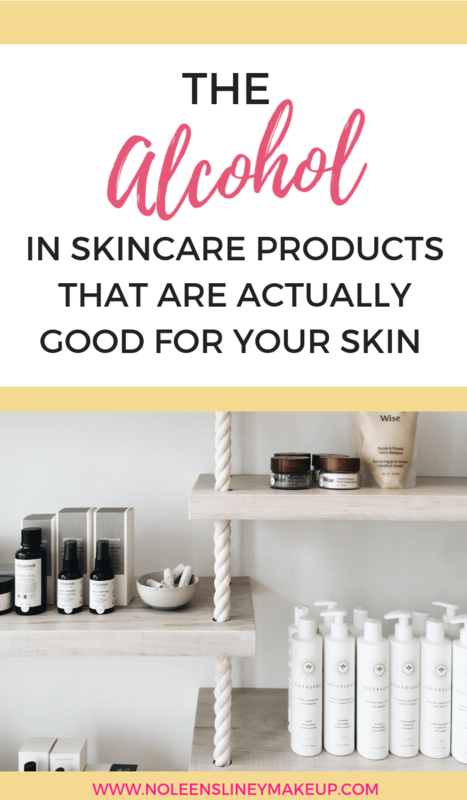 So now that you know which alcohols are bad and which ones to avoid in your skincare products and why, it’s now time to get to the good stuff! Why are the ‘good alcohols’ so good for your skin? Good alcohols are the ones that have the opposite effect of the bad alcohols. These are ones that actually nourish your skin. They’re referred to as fatty or wax alcohols. As they contain lots of fatty acids they’re so beneficial for the skin as they protect it and keep moisture in (whereas the bad alcohols damage and dehydrate your skin). These type of alcohols are found in creams and moisturisers as they’re great for hydrating the skin. They’re derived mostly from more natural sources such as palm oil and coconut oil. Their purpose is to emulsify beauty products. This basically means they help to mix water and oils together. And this helps give a lovely smooth texture to your creams and lotions. They also give the products a thicker consistency. And, as I’ve already mentioned, they’re emollients which protect the skin and keep it hydrated by locking moisture into the skin. Let’s look now at some of the good alcohol in skincare products. Make sure to also read this post where I talked about the 5 skincare basics that are essential for healthy skin. Although the good alcohols are not irritating like the bad ones are, you should still be very cautious if you have sensitive skin. This will really depend on your skin and how sensitive it is. Sometimes all alcohols, even the good ones, can still cause your skin condition some irritation. So it may be best to avoid alcohol in skincare products altogether. Both the bad and the good ones. Or at the very least, make sure to get samples first so you can test the products to see if your skin reacts to them. Did you find this helpful? How does your skin react to alcohol in skincare products? Let me know in the comments below.